Mr. (Alex) Macpherson having handed in his resignation (as Clerk/Treasurer in 1901), his son J.A.L. Macpherson was appointed Clerk at a salary of $400.00 per year, and I (David Lyle Streight) was appointed Treasurer at the same salary. When I accepted the position as Treasurer, all banking business had been done through the Bank of Toronto for upwards of fifty years. I found it very inconvenient and a loss of valuable time to deposit all monies in Toronto. I therefore suggested that the Township account be transferred to the Bank of British North America in West Toronto. This suggestion was finally carried out. This change was a great improvement for the time being, but still much valuable time was lost in making deposits. I suggested to the Manager of the Bank of Toronto and the Manager of the Bank of British North America the advisability of opening a branch of their bank in Islington. Each one declined to entertain the proposition on the grounds that there was not business enough in the locality to support a bank, and furthermore they had the Islington business already in the Toronto banks. The United Empire Bank of Canada, incorporated in 1906 with George P. Reid as General Manager, offered to open a branch in Islington on condition that the Municipality would give it the Township’s business. The Council discussed the proposition very carefully, as this new bank’s Capital was not equal to the older financial institutions. Finally, they decided to open an account in its bank with a $2,000.00 deposit, until further information was obtained with regard to the Bank’s Financial condition. The Council’s decision being given to Mr. Reid, he decided to open a branch if I would act as Manager. He said a local man would be better than a stranger to get the business. Also, I being Treasurer of the Municipality would carry an influence in establishing the bank’s credit, and in securing deposits. I at first declined the proposition, but being urged to accept, I decided to take the management until such time as they could secure a regular experienced Banker. 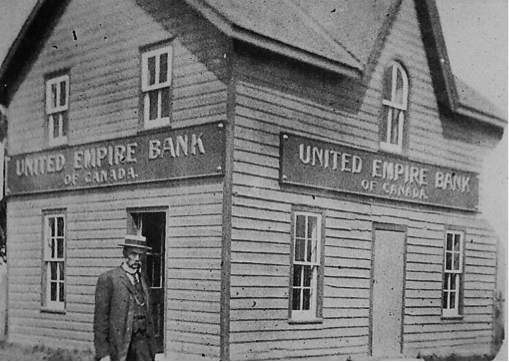 David Lyle Streight in front of the United Empire Bank branch that opened in Islington on the southeast corner of Dundas and Cordova in a former house. ​Getting a Chartered Bank in Islington at that time was a nine days wonder (i.e. something that arouses great interest, but only for a short time), and convenience and benefits derived therefrom were soon appreciated by the general public who patronized it to a large extent. About three years later the United Empire Bank was absorbed by the Union Bank. In the meantime, the Sterling Bank had opened a branch in Cooksville which after three years had proved a failure, closed their office and moved to Port Credit. A deputation from Cooksville waited on me at the Bank in Islington to see if I could prevail on the Union Bank to open a branch there. I laid the matter before the Bank Officials in Toronto. They did not look on the proposition with much favour, as the Sterling Bank had failed after three years trial. Finally, they decided to open a sub-branch in 1911, giving me oversight and management of the same in connection with the Islington Bank. 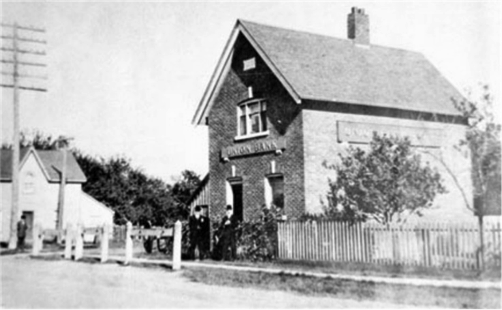 In March 1916 I forwarded my resignation as manager of the Islington and Cooksville Branches to the Head Office of the Union Bank, on account of the increasing responsibilities in connection with the Bank, at my age of 74 years. I felt a rest from the worries of business was my due. The Royal Bank building that replaced the old Union Bank building on the southwest corner of Dundas and Cordova. 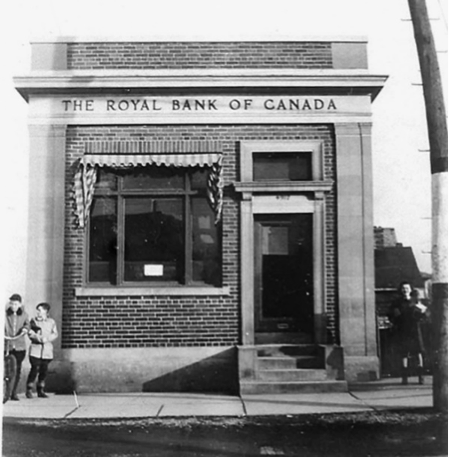 The Royal Bank is located today on the northwest corner of Dundas Street West and Burnhamthorpe Crescent. Being relieved of the Bank’s responsibilities, I next handed in my resignation as Treasurer of the Municipality of Etobicoke. This was accepted one year later in 1917 when I had been treasurer for 17 years. Having sold my old house on Canning (Cordova) Avenue in 1922, my wife and I have been living retired with my son, Lieut.-Col. J.E.L. Streight, in Islington to the present date – March 20th, 1929. (David Lyle Streight passed away on May 11, 1929 in his 88th year. There is, however, one more vignette to add to this story that Streight does not mention. Several sources have said that the United Empire Bank told Streight that before they would open a branch in Islington, the villagers would need to commit to having at least $10,000 in deposits. Streight personally canvassed for three days, and in that short time managed to obtained commitments from local residents for $12,000… a formidable achievement!